Apple Inc.'s install base of Mac OS X users will be approximately 22 million strong come the end of March, ahead of the company's next-generation Leopard operating system release, according to analysts at Bank of America Securities. The figure is up by 6 million users since the Mac maker unwrapped its last major revision to the Mac operating system, Mac OS X 10.4 Tiger, back in June of 2005, analyst Keith Bachman told clients in research distributed earlier this week. According to Bachman, major operating system releases are amongst the most lucrative for the Cupertino-based company, with gross margins that range upwards of 90 percent. "At the time of product launch, Apple capitalizes the cost of software development and amortizes such cost over three years, meaning the Apple?s profit margins are very high at the time of product launch," he explained. The securities analyst is forecasting the combined release of Mac OS X 10.5 Leopard and associated iLife '07 digital lifestyle suite to generate approximately $200 million in incremental revenue for Apple, compared to the $135 million drawn from Tiger. "We believe that Apple will sell approximately $185 million of Leopard in the June and Sept quarters, which we assume will be biased to the June quarter, depending on the release date," he wrote. "We believe that Leopard will sell for around $129." Bachman estimates the resulting impact of Leopard to generate $0.07 to $0.09 per share to Apple's combined June and September quarters. "Based on Leopard alone, we see upside tension to Street estimates for the June and Sept quarters," he wrote. As a direct result of the new software releases, the analyst is projecting Apple's software segment to grow by approximately $115 million quarterly in the June quarter to $450 million, representing 45 percent yearly growth. The firm's September quarter should subsequently yield about 15 percent yearly growth to $360 million, he added. For Apple's current March quarter, Bachman is forecasting earnings of $0.56 compared to Street consensus estimates of $0.61. For the June quarter, he's modeling earnings of about $0.75 compared to the the Street's $0.68. "Our guess is that we are more bullish on the June quarter due to our expectations on Leopard," he told clients, noting that uncertainties regarding Leopard's release date make precise predictions more of a challenge. "Trying to disaggregate the impact of any one item from Street estimates is difficult at best." The analyst maintained a Buy rating on shares of Apple with a 12-month price target of $107. Oh, they're 'bullish' all right... but if Apple misses a calendar Q2 release for Leopard, even by a lil' bit, they'll all run around like their hair's on fire, screaming that the sky is falling. Analysts are basically that really tweaked-out fair-weather friend you hated back in high school. Yeah, I gotta agree with you about the analysts. 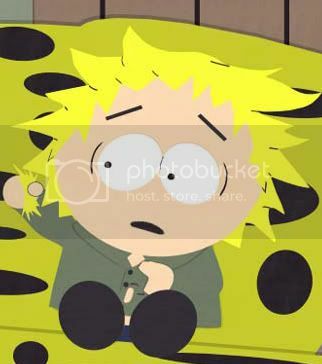 Actually, when I read these analyst reports I always picture them as the character Tweak on South Park. It seems to keep them in proper perspective. Read any analyst article with a picture of Tweak in mind and keep it in perspective. It's not an AI article unless it mentions that Apple is based in Cupertino, and yep, it's there. It's getting to be beyond totally pointless to mention it, you might as well say that Apple is based on Earth. Didn't you know, Jeff? It's ALL about Cupertino. You mean when you peg an analyst smack dab in the middle of their forehead, all your mates cheer and buy you a round? 22 million users is simultaneously impressive and slightly depressive. Impressive because that's a lot of pointing and clicking naked apes. Slightly depressive because there's like over a billion Win users. We've come so far, but baby, we still have a hell of a long way to go.